Every Christmas season classic Christmas stories resurface for us to enjoy once more. Much of their charm and appeal is how their plots seem to be timeless. What was true at the time they were written remains true when they are retold. The following Christmas tale was published one year ago to mark the second Christmas after Father Christopher’s unjust banishment from St. Isabel Church in 2016. Unfortunately, Fr. 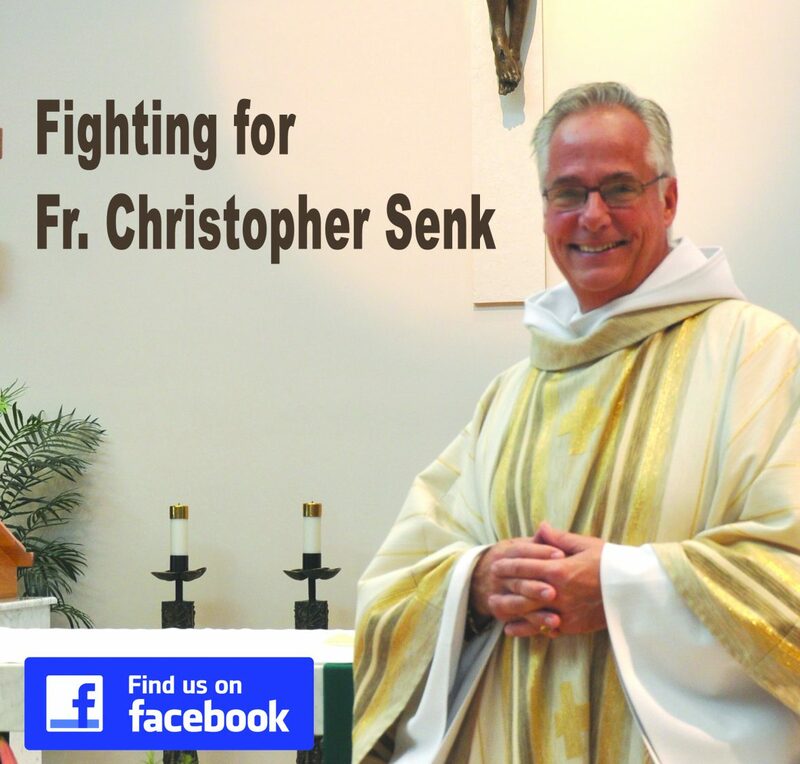 Christopher now faces his third Christmas season in which he is unable to celebrate Advent and Christmas Mass in his parish with the parishioners he has loved for over fifteen years. Equally sad is that this Christmas tale is still just as appropriate as one year ago, for nothing has really changed in the past twelve months, although some might say that the situation at St. Isabel is even worse than last year. Acknowledging the sad fact that this Christmas tale is in its own way “timeless” we offer it to you again, with a Christmas wish that justice will prevail and it will only be a cute parody in Christmases to come. Leaving the cathedral he saw its reflection grow smaller and smaller in the rear view mirror. Driving miles from the sacred space, indeed to another city, Frank Dewane opened the electric gate he had installed to surround the estate he occupied after taking command of the diocese years ago. Entering his luxuriously appointed abode he thought to himself how appealing the thought of a nightcap sounded to end what had been a long day. Yes, another drink would be perfect to conclude this twenty-fourth day of December. He sat down at the bar, reached for a familiar bottle and proceeded to pour. Lifting the beverage to his lips, he suddenly felt a soothing wisp of air as if someone had let a gentle breeze drift quietly through a nearby open window. The unexpected waft caused a cocktail napkin to float silently to the floor. Groaning, bending over to retrieve it, in a whisper that inexplicably seemed to fill the room around him, he heard a voice calling, “Frank Dewane”. He uprighted himself so that he once again was facing the mirror behind the bar. Fortunately, he did not see his own reflection, but rather the face of someone else. “Who are you?” he inquired to what should have been his own likeness. “In life I was your predecessor,” came his answer. “Bishop Nevins?” he muttered in a questioning manner while in fact he knew the guess to be correct. “Yes, Frank, and I am disappointed at what I have seen happening in my diocese in the course of these past ten years. However, in the true spirit of Christmas and Christianity, I have found it in my heart to forgive you. Tonight you will be visited by three spirits. Look for your own heart and see if you can find the true spirit of Christmas and Christianity that I pray exists somewhere deep within you.” And with that, the image in the mirror faded away leaving Dewane to face himself in the mirror once again. Dismissing the promise of spirits to come as a truth he just did not wish to accept, Dewane lumbered off to his bedroom and swiftly fell into a deep sleep. Ignoring Dewane’s refusal, the figure magically lifted him and transported him to a distant place. “Where am I? What is this place? There is a palpable feeling of love and joy that is almost overwhelming. Everywhere I look I see people filled with the Christian spirit, enjoying the fellowship of those around them. The love of God is real and present here, and as warm and comforting as the beautiful music that surrounds me. I don’t know this place,” Dewane exclaimed. “No, you don’t,” replied the figure floating over his shoulder. Once again, dismissing the truth that lay before him, Dewane shrugged it off and found himself back in his gated refuge. Listening inattentively, and spying an unattended libation, Dewane quickly snatched it up and took a swig hoping to go unnoticed. An immediate sense of caring for others swelled within him, a feeling totally foreign to him in his almost seven decades on the planet. “It is the Milk of Human Kindness, and it is no surprise to me that this is a drink you are totally unaccustomed to its taste. Now put that down, for we have a place you need to see.” And, in the blink of an eye, Dewane and the magnificent figure materialized in a location away from the bishop’s estate. “Can we leave this place now? It is no longer a pleasant place to be,” sniveled Dewane. “Yes, that is precisely what the people you no longer see here have decided.” And, in an instant, Dewane’s wish was granted and he was away from that place of despair, back in his ever-so-safe corner of his world. Back, but he was not safe from the realities he so often chose to ignore, for there lurking in the shadows was the third spirit, whose visit was foretold. The ominous figure exited the shadows as it approached Dewane. Circling the obstinate bishop, the figure found Dewane’s confidence diminishing. Completing its third rotation around him, they found themselves visiting the place that Dewane had now come to know. “I know this place. This is St. Isabel Church! But there is no one here… anywhere! Do not tell me that everyone has chosen to leave. Have they left for other churches off the island? Have some even left the Catholic Church?” Dewane looked at the foreboding figure for some type of response. The figure acknowledged his questions with a single, silent nod. Offering no words, the figure vanished and Dewane found himself once more alone in his Sarasota home. Waking the next morn, Dewane was relieved to find that the interference of the three spirits only ruined one night of restful sleep. “What did it all mean anyway? Was what he saw at St. Isabel really happening? Was what was foretold really destined to happen? Was he really the cause of such hurt and destruction? Did he really have the capacity to find the true spirit of Christmas and Christianity within him and correct the wrongs he had done?” The thoughts rolled around in his head as he sat comfortably in his gated estate. It was now Christmas Day! A joyous day, cerebrating the birth of our Lord, Jesus Christ. A season of hope for mankind, goodness and truth. Dewane realized he was now being given the opportunity to correct some of the painful hurt he had brought upon one of his priests and the people in his parish. The spirits had visited him to illustrate that it was not too late to change his ways. Dewane stopped. Reflected on what he had witnessed. He pondered. He thought… perhaps he should give this opportunity to change some serious consideration. Pray that someone will do something to end the injustice. Merry Christmas from Michigan to all. Pray for the people of Indonesia today … we can all still pray for others !